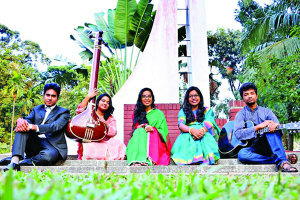 Mahmudul Hoque Khan Dulal: Moumita Hoque Shenjutee took part in a competition first of her life and secured the first position both in Classical Music and Nazrul Sangeet as well. It was an event of November 20 and 21 of this month , an Inter University –Cultural competition which was organized by Dhaka University Cultural Sagshad. Held at the TSC auditorium the winners were given away prizes by Prof. AAMS Arefin Siddique, Vice Chancellor of Dhaka University as the chief guest. In the program 750 participated in 22 sections. Among the the contestants five were champions in more than one section and they were Moumita Hoque Shenjutee in Classical Music and Nazrul Sangeet,, Faisal Mollah in Debating, Kamrunnahar in Acting,Shoummo in Modern song and Niladri in Dancing. Moumita is studying Hons. In English Literature and now a first year student of Dhaka University. She had the affiliation with music due to his only elder brother Shajid Ul Haque Aabir’s inspiration.When she was a little girl and could speak a little bit her brother Aabir used to take her in his music school.In this regard her father Enamul Haque Khan Enu did a lot for his two offspring. As if today this senior journalist doing his best to make her efficient in music. While Aabir used to learn music from the music school Moumita also tried to sing. In this way her steps in music world began. When she was admitted herself in class one in school she was also admitted in music school at the same time and learnt music there long six years at a stretch. She first learnt classical music ostad sanjeeb Dey and as of now she has been having lessons in classical music to him since 2009. Meanwhile she has introduced herself as a good singer as she has already been performed in many channels including BTV, Ekushey TV, Banglavision, RTV, Desh TV and so on. A very prospective and committed singer Moumita has a desire to have cling to music till her whole lie. Moumita Haque Shenjutee’s ancestral home is at Madaripur. The name of her native village name is North Baghuria ( A renowned Kha bari, Chairman Bari also)under Bakigram Union of Kalkini. As they are raised in Dhaka since their birth and they hardly go there. Aabir the elder brother of her was also a student of Dhaka University and did his Hons. in English Literature and M.A in Applied Linguistics. He also did an excellent results in academic life. 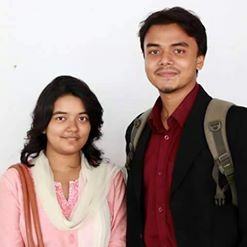 Now teaches as an young Lecturer at the University of Asia Pacific, UAP in the capital City, Dhaka. Aabis also sings well. Apart fro this he writes well. He composes music, writes novel, short story and poems as well. He also makes short film. 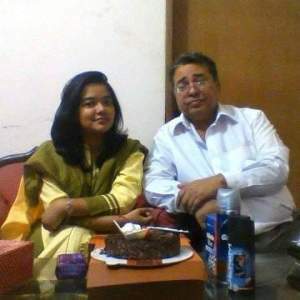 Her father is a journalist and now leads a retired life and mother Rokeya Begum was a banker and this year she went retirement from Bangladesh Bank as Joint Director.